Innovation, new concepts and technical developments continually render what were once problematical processes into simple and cost effective operations. Tapping – the cutting or roll-forming of threads – is a typical example. 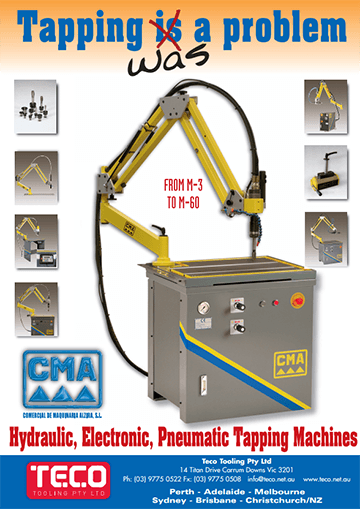 Tapping between M2 and M60 with virtually no tap breakage, is today an easy, flexible and highly cost effective operation, made possible by a comprehensive range of electronic, pneumatic and hydraulic tapping machines offered by TECO Tooling, Carrum Downs, Victoria. All machines are manufactured in Western Europe. Many of these units have been operating successfully in Australia in a wide range of industries since 1989 and their use is steadily increasing. Continuing reports endorse their reliability, ease of operating, high thread quality, greatly reduced tapping time and confirm significant overall cost reductions. The basic concept of the TECO Systems is to take the tap to the work-piece. Torque absorbing, pantographic arms render the tapping head weightless and keep it square to the work, thereby creating the ideal conditions for tapping or roll forming. These elements, together with variable speed drive motors, a range of sensitive, adjustable torque release chucks, virtually eliminate tap breakage on both blind and through holes. This makes the use of top quality taps affordable yielding perfect threads true to gauge. Taking the tap to the job greatly reduces time consuming handling of the work-pieces. It also enables tapping to be removed from CNC machines, avoiding the risk of costly production disruption, should tap breakage occur. The pantographic arms still allow tapping to be done while the work-pieces are on the CNC, particularly those having a pallet changing function. The wide reach of the arms give operational flexibility, which is another major advantage of the system. Some tapping units are fitted with a multi-position head that enables tapping at various angles. All tapping units are ergonomically designed. The finely balanced arms make the machines very simple to use, even by unskilled staff. A wide range of accessories including movable bases, tables, magnetic clamps and built in spray-mist tap lubrication units, further strengthen the flexibility of the TECO Systems. The attachment of drill chucks will allow the machines to be used for reaming and counter-sinking. Furthermore, button die holders can be snapped into the Bilz style quick change chucks fitted to every machine. The supplier considers it important to carefully evaluate individual current and future tapping requirements, in order to provide the most cost effective system to meet specific individual needs. These systems have certainly made tapping and thread forming today a problem free process.